I read an article on Huffington Post yesterday about a pair of moms who are designing and creating dresses for girls that feature things like dinosaurs, aliens and trains. This was seen as “unconventional” in the world of fashion for young girls; I’d have to say, I agree. Just walking through the aisles of the toddler section at Target, I’m bombarded by either pink-ruffles-pearls-princesses or ninja-super-alien-fire truck. There is no gray area in terms of clothing for young children; it’s either very blue, or very pink. A few months ago, one of the boys in my son’s class had a birthday, and cupcakes were brought in for all the toddlers to enjoy (because toddlers totally need cake and frosting at 3pm on a Tuesday, right?) There’s an even split of boys and girls in Miles’ classroom, which this student’s mom had noticed. She brought in eight blue cupcakes and eight pink cupcakes. Each was adorned with some sort of plastic trinket on top, with the blue cupcakes having soccer balls, and the pink cupcakes having Hello Kitty rings. The plastic choking hazards were removed prior to cupcakes being served. As each student left for the day, one of the teachers invited them to grab one of the plastic items from the basket they’d used to collect them. Two moms who arrived at the same time I did chose for their children: soccer ball for a boy, kitty ring for a girl. When it was our turn, I let Miles choose. And do you know what he picked? I instinctively prepared to defend his choice, thinking his teacher might suggest a soccer ball, but she just smiled. Miles happily took his kitty ring, and we were on our way. 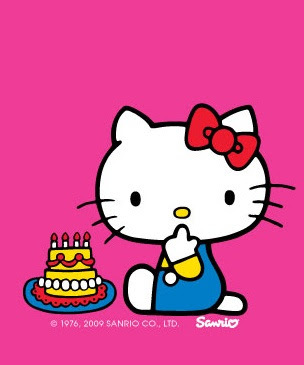 He didn’t choose Hello Kitty because of its color or cupcake association; Miles chose the cat because we have four cats at home, and by default Miles loves cats as much as his crazy cat loving mama. Not a day passes where he doesn’t give at least one of them a “big hug” (read: squeeze their internal organs). Most car rides home from school involve some sort of discussion about Frankie or Patches or Blueberry or Pookie. He loves these little furballs. He also loves our dog, and if the choice were between plastic dog ring and plastic cat ring, I’m not sure what he would have decided (catcatcatcatcat). And he really really loves dinosaurs, so if the decision fell between cat and T-Rex, well, that would be an obvious choice for him. He simply chose what he liked. Kids don’t see things the way some adults do: pink or blue. 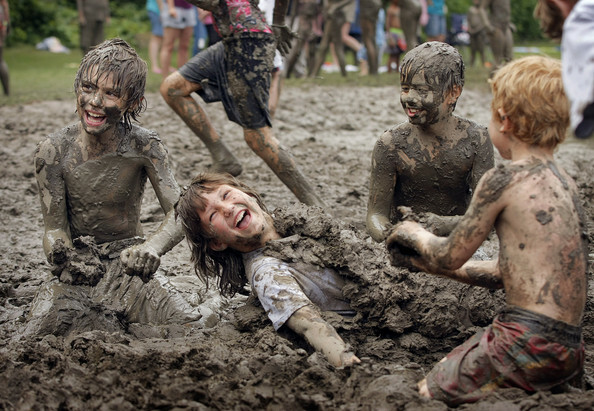 Kids see things the way they truly are: fun or not fun; yes or no; want or don’t want. It’s very simple for them. So, boys can like cats and girls can like rocket ships, and life still goes on. Kudos to the mamas thinking outside of the pink and heavily glittered box. Link to HuffPo article on Princess Awesome dresses. 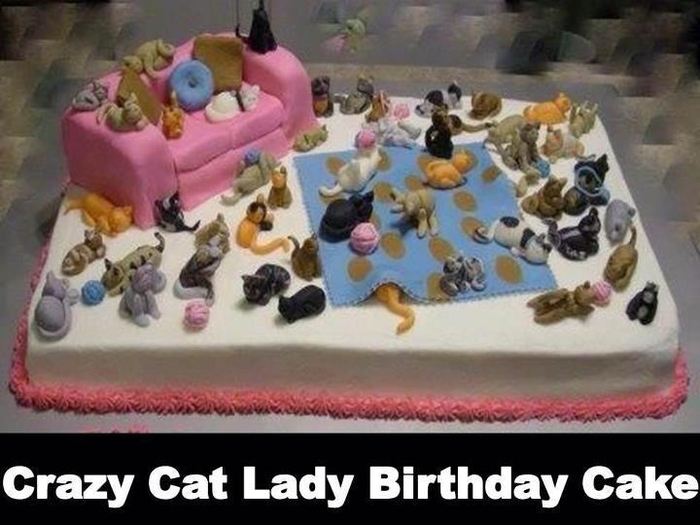 FACT: You can have children AND be the crazy cat lady. I love cats, a lot. I love them more than cheese fries and brownies and fried pickles and all the other things I secretly eat then feel guilty about later. 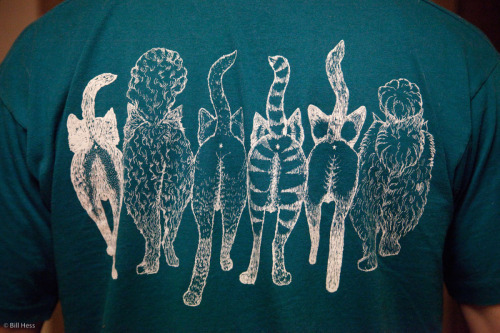 I love cats so much that as a young child I not only subscribed to “Cat Fancy” magazine, but I also had one of those t-shirts with a chorus line of cats coming and going (you know, whiskers on the front and poopers on the back). You wish you had one. With total disregard for my lameness (not lame, totally cool, no one else got it) I proudly displayed my feline affection. Oh cats, how I love thee…let me count the enormous stuffed animal (all cats) collection in my childhood bedroom to number the ways. CATS ARE THE BEST. We always had a small herd of cats growing up, and all of them were rescues. When you’re raised in a small farming town, and a pet passes on to Pet Heaven, they get buried in the backyard (this is not weird, stop looking at me that way). So when I tell you we had a multitude of cats through my childhood and teen years, realize that also equates to your furry best friends growing old and passing on to that great cat tree in the sky. 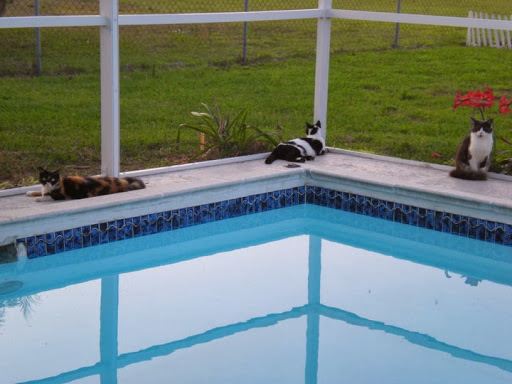 I have always imagined that if the current owners of my childhood home ever decided to put in a pool, and they dug up a certain corner of our backyard, they would be deeply concerned and/or horrified at the number of cat skeletons. Maybe they’ve read Pet Sematary by the great and powerful Stephen King. And maybe they moved out instead of putting in a pool. That would make for a great novella one day, right? Poltergeist meets Pet Sematary meets Cat Fancy. Anyway. Rescuing cats. It’s a genetic trait for some of my family members, me especially. I want to save all the cats. In May of 2003, I moved into my first apartment. 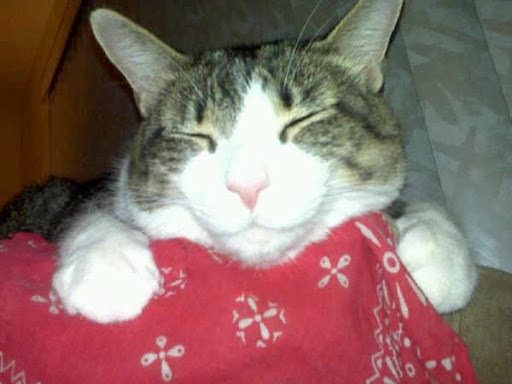 Less than a month later, and with total disregard for my then-roommate’s cat allergy, I adopted a fat tabby cat. His name, proudly displayed on the tag of his kennel, was Binky. In my 19-year-old brain, I decided that Mai Tai was a much more suitable name. He is most often called Pookie, because I’m one of those really awesome people who gives a pet a name, only to call them exclusively by a series of nicknames. Pookie will be fourteen years old in May. He has guaranteed he will live to be at least 30 years old, though. 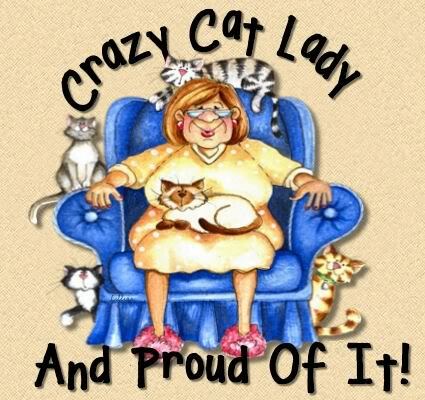 I am in the 90th percentile for Crazy Cat Lady potential. People will tell you that this can be avoided by getting married. WRONG. People will also tell you this can be avoided by having children. DOUBLE WRONG. If you have the potential, it never leaves you. Maybe that tiny, crazy voice is quieter at certain times (or being drowned out by the sound of your toddler sliding the dining room chairs all over the house) but the voice is there, lying in wait. After months of feeding them, getting them to accept my overwhelming love and then giving them names, we knew we had reached a crucial point: they needed to be spayed and neutered, and they need to be adopted. Watching them out the front door window, all three snuggled up together on the giant dog bed we’d given them, I realized that these three siblings couldn’t be separated…and in my heart of hearts, I just knew that no one would adopt three cats (which we had affectionately dubbed “The Wild Bunch”). And so, the decision was made for us by the furballs on the front porch. We crated them (that is an awesomely insane story for another day) and took them to our local PAWS to have them all snipped, clipped, chipped and vaccinated. WELCOME HOME, KITTIES. Three fatties: Blueberry, Patches and Frankie. Pookie adapted pretty well for an old dude. We agreed that four cats was plenty, and we would adopt no more. I avoid adoption days at PetsMart like the plague. I will cry for the kitties waiting to find forever homes. When those stupid ASPCA commercial with Sara McLaughlin singing come on, the channel cannot be changed fast enough. I love the ASPCA and all they do, but my fragile emotional state and internal Crazy Cat Lady cannot handle the sads. AND NOW…For the past week, two cats have been hanging out in the preserve across the street from our house. Like the Wild Bunch we adopted three years ago, these two new cats have been sleeping in the culvert. They are beautiful, obviously cared for, and clearly abandoned based on the length of time they’ve been here. I cannot fathom abandoning a pet (okay, maybe my husband’s parrot, but Kiwi is the Winged Apocalypse) and I cannot believe that a person would leave two pretty babies to fend for themselves. Heaven forbid I find the person who left them. I hope they died peacefully in their sleep, and the cats escaped the house in search of food. If they did not die peacefully in their sleep, the will die unpeacefully in their awakeness. TRUTH. I contacted a local no-kill shelter, only to find they only accept owner surrenders. This breaks my heart, even though I understand situations arise in which pets cannot go with you. And I am thankful a shelter exists that will take the pets. And I am filled with rage that the owner of these two cats did not do a little research and take the cats to this shelter; now these babies aren’t eligible. I then contacted our county’s animal services division, and was told that their hold time for abandoned pets has been reduced to one day. This means that in 24 hours, if the owners haven’t claimed the pet, they are evaluated to either be euthanized or put up for adoption. That’s not a lot of time; I would pray that the cats are put up for adoption, but the reality is that they’re cats, not kittens, and the likelihood of them being adopted is reduced, with the likelihood of them being euthanized is increased. My head and heart cannot handle the guilt of that possibility. Now what? We have four cats. Did I think having Miles would reduce or eliminate my affinity for saving the world? Absolutely not. Do I think six cats would be too much for our tiny home? Well, for our tiny home, yes…but for our enormous hearts, there is plenty of room. I have posted on Craigslist, hoping to find the owners. But for now, we’re sneaking plates of turkey and cat food across the street (my kind and lovely neighbors, who take care of our own herd of cats when we’re out of town, have assured me we do not need more cats) in the cover of darkness to avoid any backlash. They are friendly. I will provide a photo as this relationship progresses. 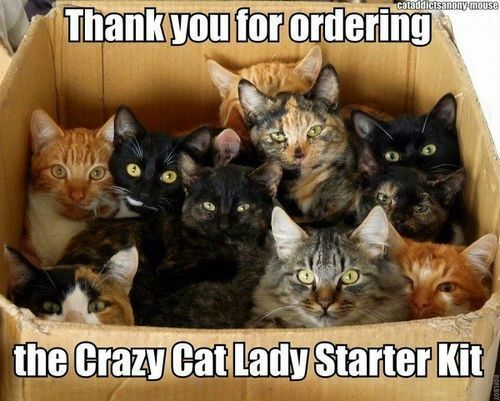 Place your bets now on whether I enter the 95th percentile of Crazy Cat Lady potential. If you buy me this shirt, I will wear it.